How is Jack Today? : Two More Teeth! So once again I feel like a complete moron when it comes to mothering this child. Jack has been a little fussy, not napping well, chewing on anything and everything. So I assume it's his teeth and I've been putting orajel on his top gums at night. He has two big white blisters where his top teeth will be, so every day I'm checking for the teeth. Today I took a peek at his bottom teeth to see how far through they were, and lo and behold, what did I see but two new teeth on the BOTTOM! I called Julie of course to make sure that was okay. (I don't know what I would do if it wasn't, but I still had to check.) I thought teeth had a particular order. Apparently not. So now he has four bottom teeth and no top teeth. Very attractive. I can't get a good picture yet but as soon as I have one I'll post it. Yesterday we spent some time up at my mom's house. We drove up to Carefree hoping Bonnie's would be open (of course it wasn't) but right next door is a great restaurant. So we had some lunch and hung out. Jack loves restaurants – he’s just a busy little guy with his toys and his food. 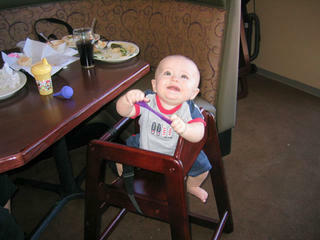 Here you can see him sitting straddled in the high chair. Today he’s off to Grandma Gloria’s again. I know it seems like I ship him out to her an awful lot, but she’s going back to school August 8th so she has to cram in as much Jack time as possible before then. It’s certainly a nice little break for me! I’m going to take a nap.